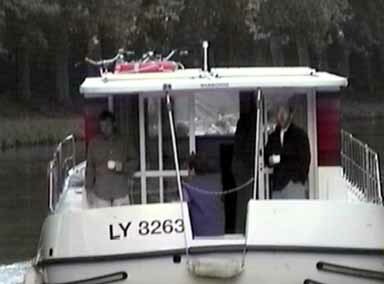 In the fall of 1998 I and nine friends spent a week on a barge cruise in southern France. 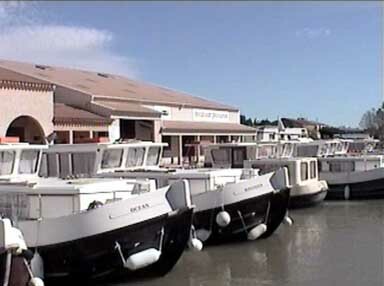 The Canal du Midi is the middle link in a continuous waterway from Bordeaux to the Mediterranean Sea. 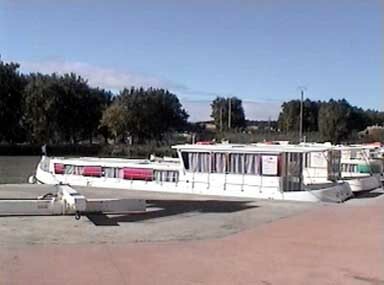 On our trip we departed at the Locaboat Port de Plaisance at Argens-Minervois and cruised upstream to Carcassonne and then returned to Argens-Minervois. Along the way we passed through the town of Trebes. Probably the most amazing part of this trip is that we all arrived in the tiny town of Argens-Minervois within a few hours of each other. Mike, Deborah, Mark and David had spent a week in Spain and arrived by train from Toulouse. Lloyd, Nancy and Carol all arrived directly from the states, and caught a later train from Toulouse. Gillian and Chris had been in Zimbabwe before flying directly to France. 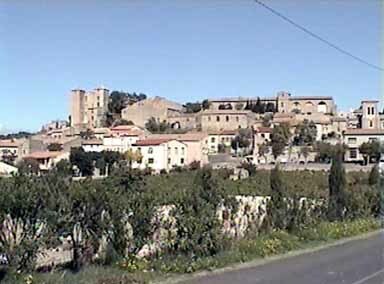 I had arrived two days earlier in Marseille and drove to Argens-Minervois in a rental car. 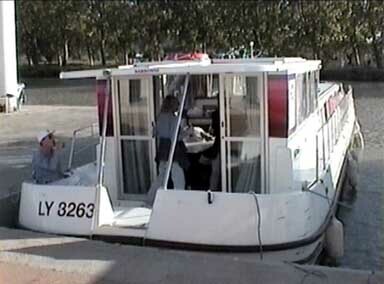 Follow the links below or in the Canal Barge Tours menu on the left to replay the journey. I have also included a page of the photographs taken by Lloyd Ator on the trip (one of which is the group picture above). All of the other pictures on this series of web pages are video captures (vidcaps) from the 8mm video I shot of the trip. These vidcaps are of much lower resolution and clarity than Lloyd's pictures. In 2016 I have started to add some of the video shot on this trip to the web pages using YouTube, which did not exist when I first created these pages. On my first day in Marseille I walked around the Vieux Port and overdosed on Bouillabaisse. I also shot some video of the harbor. The next day I used my rental car to tour the Mediterranean coast to Nice, and consumed more Bouillabaisse. 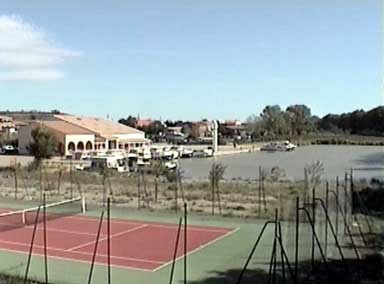 The following day we were scheduled to take possession of our barges, so I drove from Marseille to Argens-Minervois arriving shortly after noon. My addiction to Bouillabaisse would be replaced by an obsession for Cassoulet for the next week. Locaboat Port de Plaisance, Argens-Minervois I was the first to arrive at the Locaboat Port de Plaisance in Argens-Minervois, which gave me time to tour the facility and town. We chose Locaboat as our charter firm because of our previous experience with their operation and the fact that the staterooms in most of their barges are nearly of equal size. Because we were a group of singles and couples each of whom were paying an equal share of the cost of the charter it was important that everyone have essentially equal facilities on the barges. 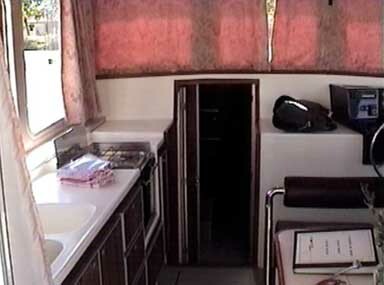 Many of the barges from other charter companies are designed for family charters with a main cabin for the parents and smaller cabins and berths for the children. That arrangement would not have worked with our group. Argens-Minervois The town of Argens-Minervois is a small wine producing town in the center of the Langedouc region of France. It is picturesque, but there are no stores where we could purchase our supplies for the week. Fortunately I had the rental car so when everyone arrived we formed a small group to run to the nearest Super Marche to stock up on wine, food, wine, cheese, wine, bread and wine. We chartered two barges for our group. 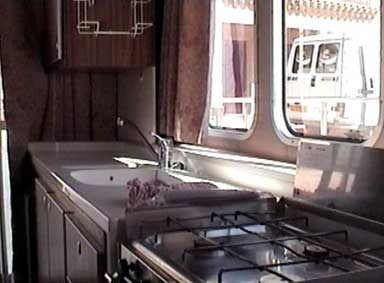 The Penichette 1500 is about 48' long and has four staterooms, each with a double berth. This barge took care of seven of the ten persons in our group. Penichette 1500 The Penichette 1500 is shown on the left and below. Penichette 1120 Helm The other barge was a Penichette 1120 which is about 37' long and has two staterooms. Mike and I were the only experience boat drivers in the group so we each took charge of one the barges. 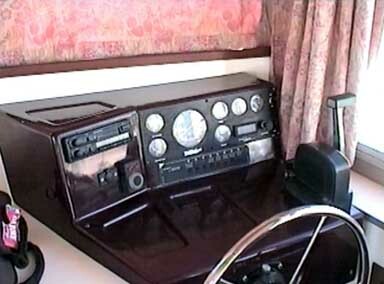 Mike had the 1500 and I the 1120, the interior of which is shown on the left and below.